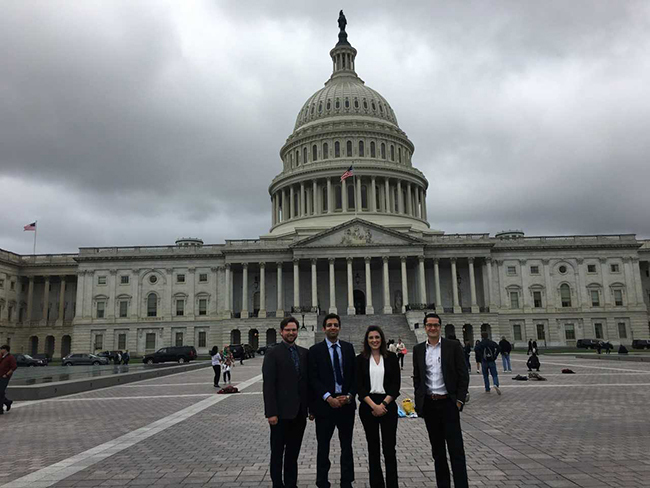 In the spring of 2018, The Optical Society (OSA) organized their yearly event, gathering members together on Capitol Hill to represent the national photonics initiative. Among the members were undergraduate and graduate students, Professors, Postdoctoral Fellows, and industry leaders in optics and photonics. CHTM students, Mahmoud Behzadirad and James Hendrie, along with Dr. Stephen Fleming, Vice President of Arizona Research and Discovery Innovation of UA, were selected as representatives for Arizona and New Mexico to meet with congressional representatives and senators of their respective states in Washington D.C. Their meetings in Capitol Hill were over concerns for future funding in optical research, prompted largely by cuts at the Federal level. Issues in education in New Mexico and promoting science at various levels and also promoting business in optics were brought up. We sat down with James and Mahmoud to ask some questions about their experiences. When they met with representatives the main topics discussed were National Quantum Initiative, the importance of funding education, especially in STEM, their own research and how it relates to modern technological advances, continued or increased funding for national research laboratories and facilities, and the importance of tech jobs in the U.S. Most legislators and their staff were captivated in what they had to say. 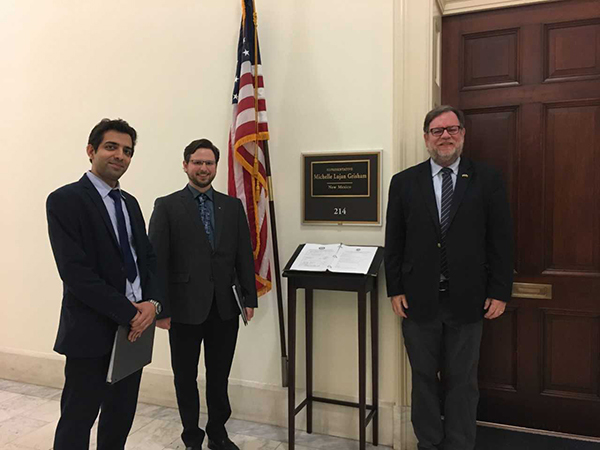 Michelle Lujan Grisham, Tom Udall, and Martin Heinrich were extremely interested and were proactive in their discussions with James and Mahmoud. Mahmoud and James attested to the success of these trips. Stating that they provide tremendous opportunities to share some part of ongoing research in labs, the funding challenges they (and others) face, and concerns about the future industrial opportunity for graduated expertise with those in charge of the country’s budgets and lawmaking. After having the opportunity to attend this event, they feel positive about the future of optics research. "It is good to know people in high positions care about technology advancement. The more they are informed, the higher the chances are that they may support science by reflecting it in the country’s budget." “Investing more money and getting more federal funds for science means hiring more researchers in optical science and as a result, there would be more optical expertise to go and join a company. If there is enough expertise in this field, companies would prefer to stay in the U.S. and invest their money here to hire highly-skilled graduates,” James and Mahmoud both stated. All in all, they had a successful trip trying to increase the awareness of the importance of research in this incredible opportunity.